It has long been thought that viruses simply “hitch a ride” on the host cell protein synthesis and nucleic acid replication machinery, and from there on, proceed with forming their particles through simple self-assembly. The present work shines light on a lot more complex process of phage infection and replication in bacterial host where phage-encoded tubulin-like protein forms a nucleus-like structure spatially sequestering select molecules. Using Pseudomonas host, the authors constructed green fluorescent protein (GFP)-tagged variants of phage 201Φ2-1 and monitored the phage proteins using time-lapse microscopy. Tracking of phage protein gp105 provided the most insightful details as it was expressed first upon infection and at the highest quantity. It was observed to form a spherically shaped structure surrounding phage DNA less than an hour post infection. Detailed analyses showed that the nucleus-like structure served as the compartment where phage DNA was replicated and where transcription of phage genes took place; translation, however, occurred outside this structure. Thus, specific components of these processes were kept inside and outside the compartment, respectively, and the phage mRNA was presumably transported across the wall for translation. While the mechanistic details of this process remain unclear, unraveling the biology of the transient phage nucleus may one day lead to the discovery of new targets for antiviral interventions. DNA replication and transcription occur inside the phage compartment, whereas translation occurs outside. (A to D) Localization profiling of GFP-tagged phage and host proteins involved in various functions at 60 mpi. All proteins were fused to GFP (green), DNA was stained with DAPI (blue), and membranes were stained with FM 4-64 (red). (A) Proteins predicted to be involved in DNA replication, including the phage proteins gp237 (RecA homolog), gp197 (helicase homolog), gp333 (ligase homolog), gp240 (RNase H homolog), and host DNA topoisomerase I. (B) Two phage-encoded proteins predicted to be involved in transcription, gp107 and gp130 (RNA polymerase β′ subunit homologs). (C) Host proteins involved in translation, including ribosomal proteins L20 and L28, translation initiation factor 1 (IF1), and peptide chain release factor 3 (RF3). (D) Phage proteins predicted to be involved in nucleotide synthesis. including gp287 (thymidylate kinase homolog) and gp350 (thymidylate synthase homolog). (E), mCherry-gp105 (red), the RecA homolog gp237-GFP (green), and DAPI-stained DNA (blue), demonstrating localization of gp237 and DNA inside the gp105 shell. (F) Time-lapse imaging (in seconds) showing rotation of the compartment and its contents. As indicated by arrowheads, the shell and gp237 rotate together (in this cell, in a counterclockwise direction), suggesting that the entire structure and its contents rotate. See also movie S5. 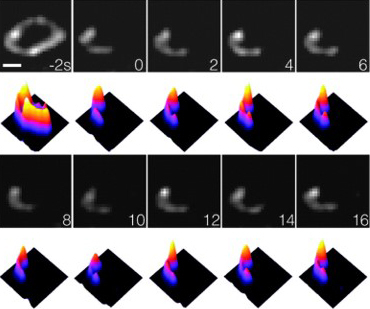 (G) gp237 moves from the host cell cytoplasm to the compartment during phage infection in this 30-min time lapse (m, minutes). The dashed circle indicates the border of the cell. 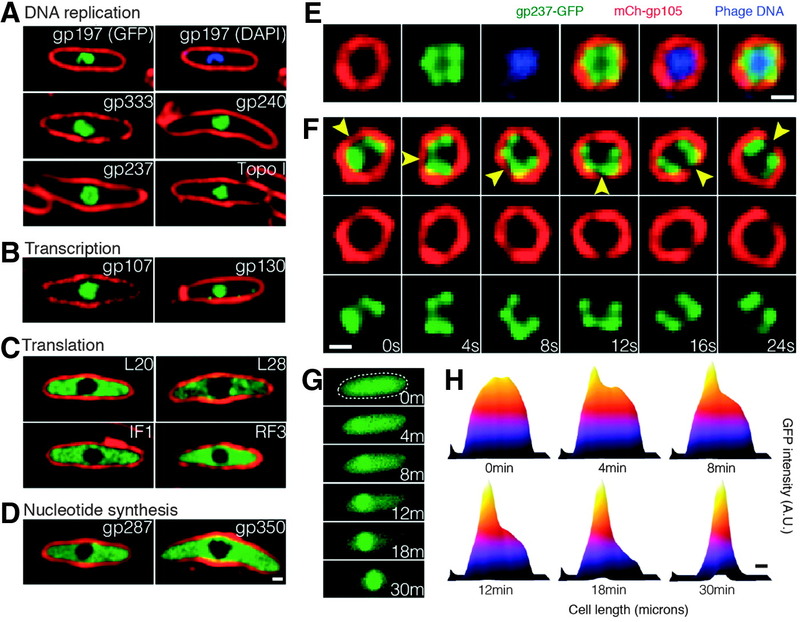 (H) Heat map of GFP intensity of gp237 in the host cell as corresponding to the fluorescent micrographs reveals that gp237 moves into and accumulates in the gp105 shell. (See also movie S4.) Scale bars in (D) to (F) and (H), 0.5 μm. A.U., arbitrary units. We observed the assembly of a nucleus-like structure in bacteria during viral infection. Using fluorescence microscopy and cryo-electron tomography, we showed that Pseudomonas chlororaphis phage 201Φ2-1 assembled a compartment that separated viral DNA from the cytoplasm. The phage compartment was centered by a bipolar tubulin-based spindle, and it segregated phage and bacterial proteins according to function. Proteins involved in DNA replication and transcription localized inside the compartment, whereas proteins involved in translation and nucleotide synthesis localized outside. Later during infection, viral capsids assembled on the cytoplasmic membrane and moved to the surface of the compartment for DNA packaging. Ultimately, viral particles were released from the compartment and the cell lysed. These results demonstrate that phages have evolved a specialized structure to compartmentalize viral replication. ASSAY & Drug Development Technologies, published by Mary Ann Liebert, Inc., offers a unique combination of original research and reports on the techniques and tools being used in cutting-edge drug development. The journal includes a "Literature Search and Review" column that identifies published papers of note and discusses their importance. GEN presents here one article that was analyzed in the "Literature Search and Review" column, published in Nature Chemical Biology titled "Multidimensional chemical control of CRISPR–Cas9", authors are Maji B, Moore CL, Zetsche B, Volz SE, Zhang F, Shoulders MD, Choudhary A. Will Less SOX2 Lead to Brain Cancer Getting Cold Feet?